I was going to write a message of heartfelt thanks to all of you for following my blog these past five months. Your feedback and comments make me happy; particularly as evidence of people actually reading my blog! 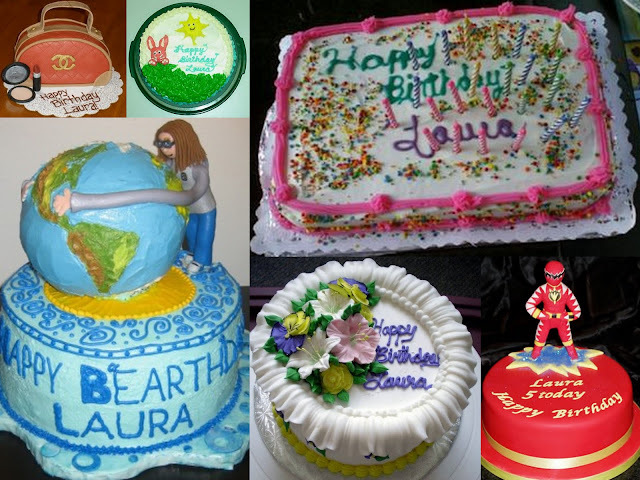 I was looking for a pretty cake to accompany this post, but, as often happens with me, I became far more interested in all of the comedy cakes I could find that said Laura. And one that said Des. I don't know what a 'bearthday' is but to all the Lauras with freakishly long arms who love the world, and all of you who've wished me happy birthday on twitter, I say thank you. Des and I are very pleased (and full of cake). Special thanks to my mummy for reading my blog every day, checking my spelling and telling me repeatedly when I have no comments. Oh, and of course, for baking me MY special birthday cake (and offering to make a trifle).